Sony has gone through various changes in their tablet division over the years to try and create that “perfect” tablet or what they thought you would like. There was the Sony Tablet S which brought with it a unique “open book” design and when lying flat it would be raised up which was good for viewing options. 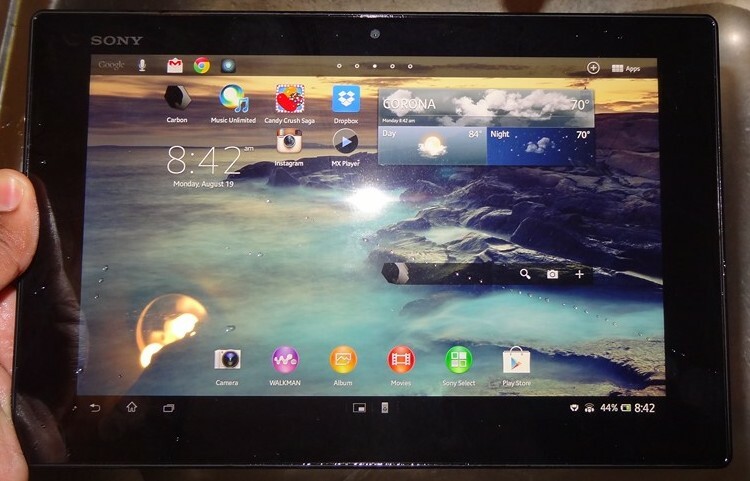 The next was the Sony Tablet P which had two 5.5in screens and didn’t do so well in the market. The successor to the Sony Tablet S was the Sony Xperia Tablet S which cut down on that arch and was supposed to be “splash proof”. There were some flaws and the device was pulled. Here we enter what looks like its greatest achievement which is the Sony Xperia Tablet Z. It was 1st announced at Mobile World Congress earlier this year and it was pretty spec heavy. It touted being the lightest and thinnest 10-inch tablet on the market. Alongside that features were the capacity of dust proof and waterproof. Essentially the Sony Xperia Tablet Z can be taken to the beach to the bath. But how does it hold up? The Xperia Tablet Z is a 10.1-inch black slab which is extremely light at less than 500 grams. Sony’s OmniBalance design is used which makes the device as minimal as possible and gives the display as much real estate as possibly needed. It is super thin at 6.9mm (0.27ins) and I can easily maneuver it with one hand not putting any strain on my wrist. 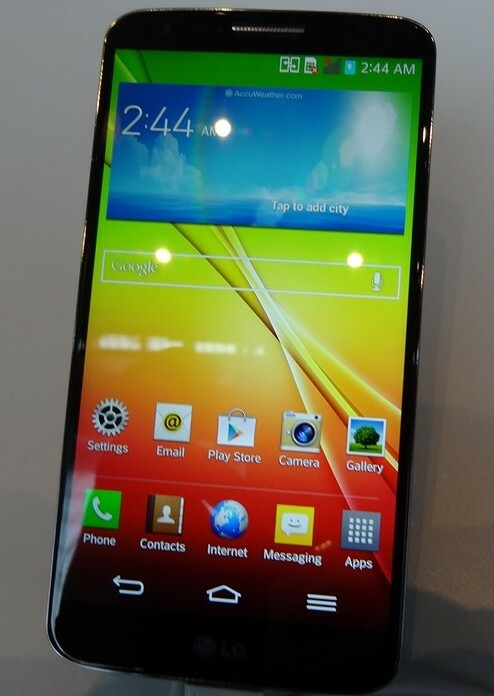 The “Reality Display” which is powered by Sony’s Mobile Bravia Engine 2 stands encased in Gorilla Glass. It’s supposed to provide excellent colors like their HDTVs. The display looks bright and sharp but the colors just seem slightly off to me at times. Taking a look at the back panel you can see it’s made of a polycarbonate which gives it a marginally better grip then the Xperia Z Phone. It wont pick up as many fingerprints either as the screen is a magnet for it. Being certified in IP55 &amp; IP57 is remarkable as it’s dust resistant and waterproof and can be taken from the beach to the bath with no problems what so ever. While understanding how the Xperia Tablet Z is built I wish it had a stand out look and had a distinct enticing look. It reminds me of the Nokia Lumia 810 which looked like a black bar until I changed the back cover to give it some more presence. The processing power isn’t a slouch by any means but isn’t the greatest out as its slightly outdated. You wont notice the difference using it though. Under the hood it’s running a S4 Pro Qualcomm chip, with a 1.5 Quad Core Processor and 2GBs of RAM. The battery is 6,000mAh which is thin when sized up against devices such as the iPad 4th Gen (11,560mAh), Nexus 10(9,000mAh) and Note 10.1 (7,000mAh). 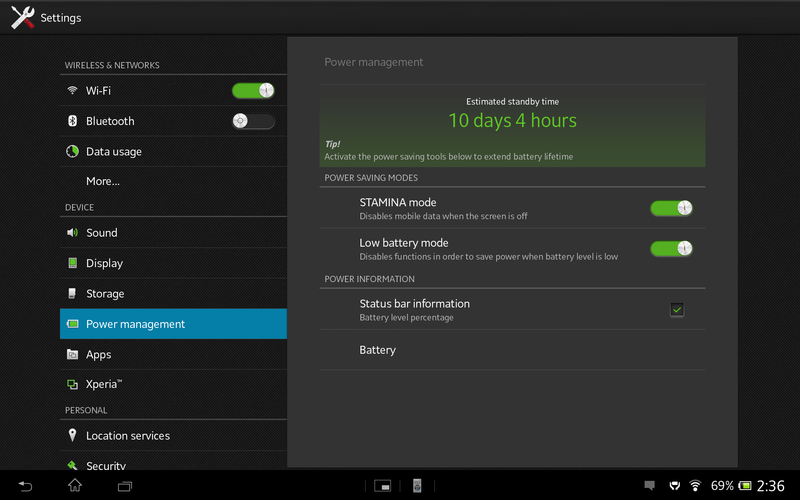 There are some features Sony has implemented such as Battery Stamina which shuts down a lot of the functions when the display is off. Also it disables Wi-Fi and data traffic. You can enable which ones you want activate for instance if I need to get my Gmail all the time but don’t want to see the latest status update on Facebook. I have left the tablet alone for days, come back and it’s still kicking. It will enable the Wi-Fi and the latest notifications will come in once powered back on. There is expandable memory if you want to go beyond the 16GB &amp; 32GB threshold and add a MicroSD card up to 64GBs. One of its main selling points is how well it handles with water. I have done everything from taking it out in the rain, run under my sink and even occasionally grabbing it to change songs in the shower. It takes water on with ease. Just make sure you keep all the ports sealed up. Otherwise you’re in for a world of hurt. The Xperia Tablet Z is the ultimate device for relaxing on the hot sandy beaches or taking a long bubble bath. It can be submerged in under 3 feet of fresh water and at lengths of 30 minutes. What happens after that or if you go slightly deeper is anyone’s guess. Speaking of those ports, they are almost unrecognizable. They blend in so easily you may have a hard time finding them. Only pet peeve with these ports is when you need to charge your tablet which is probably the only time u open them you will be doing so often opening and closing the flap. Furthermore when being submerged or having water run on it, the screen is pretty sensitive to the touch and you can see is activating different apps available. If you click on the video there is another water test I did that is slightly darker. Sony’s version of Android is Jelly Bean 4.1(unfortunately not 4.2) is light and closer to Vanilla then any manufacturer I have seen in eons. You have your taskbar at the bottom and notifications to the right as standard. Running apps such as YouTube then hoping to Netflix then doing some web browsing caused no concerns and was a relief. Sony even has a feature called “Small Apps” which is easily accessible. You can pull up a calculator, timer, a browser, remote and host of other options into just about any app your using. It’s similar to Samsung’s MultiView options but I think I like that better for multitasking but that’s all personal preference. There are some baked in Sony apps such as SocialLife which takes a compilation of your internet social lifestyle from Facebook, Twitter, YouTube, RSS and others and runs a live feed. It looks interesting but don’t know how often I’d use it. Video Unlimited is pretty pleasant as there is some exclusivity on films seeing they are coming from Sony’s catalog. I’d like some more shows in HD though as there was tons of SD even if I see them on TV in HD. I couldn’t get the Music Unlimited app to work to save my life. Whether I tried to use the Tablet or Mobile version there was always a server issue of sorts. When it comes to tablets you don’t necessarily see some of the best cameras on them and it’s usually something I tend not to pay attention to most of the time. I did give a chance to the Xperia Tablet Z camera seeing how it’s an 8MP shooter on the back featuring Sony’s Exmor R for Mobile &amp; Superior Auto plus a 2MP HD front camera. It nothing groundbreaking but is better than some of the others I have used. Taking some decent pictures and shooting some cool video on the Xperia Tablet Z works fine. The camera handles outside lighting good and inside isn’t too bad. There are some sample shots and video below. 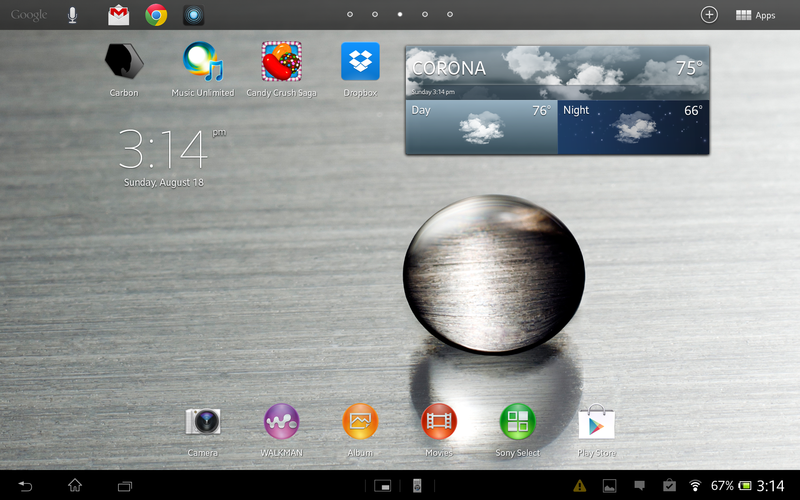 The Sony Xperia Tablet Z is a great Android tablet with some excellent features if you use them. If you’re a person that’s always poolside or on the sandy beaches then definitely pick it up. The high price of $500 is a tad hard to swallow if you don’t use these features and to its maximum. I haven’t seen too many liquid accidents involved with tablets in my eyes. Also the display while great just makes me wish it was in the range of the Nexus 10 or Samsung Note Series. Once again I love how weightless the tablet feels, and its Sony’s Android skin makes the OS run smooth without any major hiccups. In the end, are you willing to take the splash? This review is made possible with my affiliation with G Style Magazine. It is featured on G Style Magazine where you will see most if not all my reviews firsthand. G Style’s focus is mainly geared towards technology, fashion and what we think is interesting in the gadget world today. You can also check there for other reviews and tech news.